Here I tried to see how many wraps I could get with a happy message of live love laugh with extra texture symbols. I really like the texturing with some highlighted metals integrated with the darker metal colors. 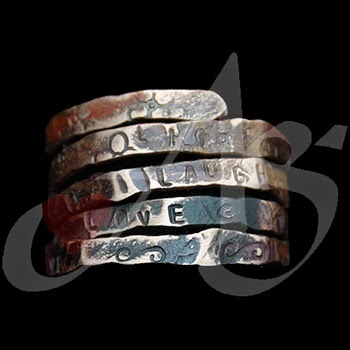 These ring wraps will make awesome thumb rings. They are fun to make and wear! ENJOY!! 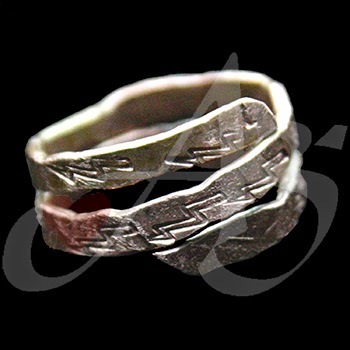 This copper ring has the same premise but not as many 'circlings' and just has symbols textured on the metal. 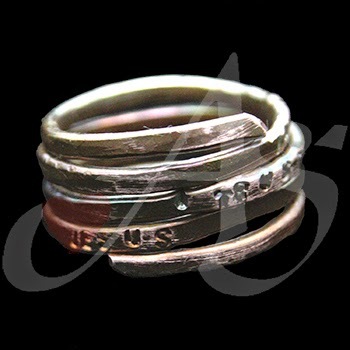 I personally like more wraps on my ring, but I have little fingers so less wraps look better!! These earrings are one of my faves! I would get lots of compliments when people would see these little beauties! 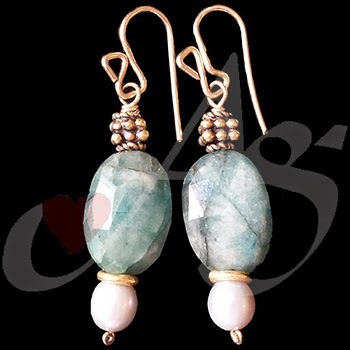 The creamy pearls and the beautiful coloring of the Aquamarine coloring with the accent of gold metal. I used gold filled wire to create all the wire works. These are truly a timeless classic look... again one of my faves...so happy the owner loves them too!! ENJOY! I had fun making these earrings - I felt encouraged to try something different with the wire wrapping on the sterling silver lever back. 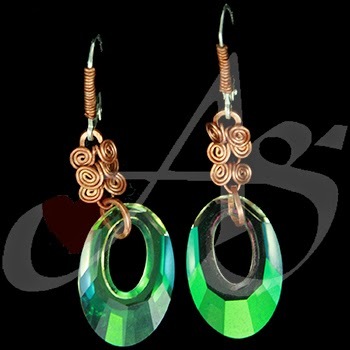 The yellowish green Swarovski are a nice contrast to the warm colors in the copper wire. Nice dangle and swing with the copper square wire work. Enjoy!! 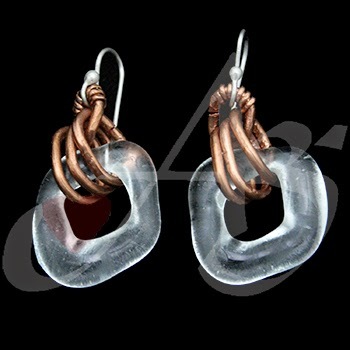 Here we have another set of copper and argentinium wire earrings with handmake glass diamond shapes. This piece also has an accompanying bracelet. Enjoy!! 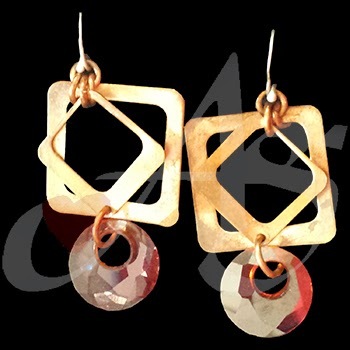 Continuing with the copper work, these earrings have some movement and swing with fiery orange Swarovski crystals at the base; again Argentinium wire work. Enjoy! Negative Space is as interesting as the positive!! 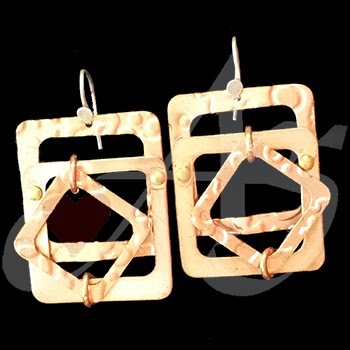 Copper earrings with various frames that are riveted together accompanied w hand crafted Argentinium silver hook. Windows of opportunity when you are wearing these artistic design. Enjoy!! 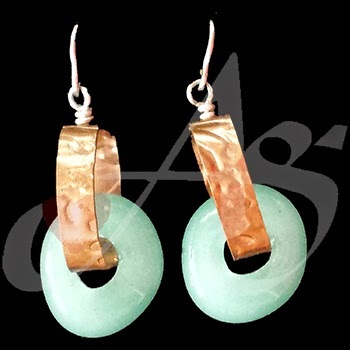 These copper embossed hand made milky glass earrings can be worn in either direction with the help of the pivot wiring at the top. These little gems generated lots of compliments. ENJOY! 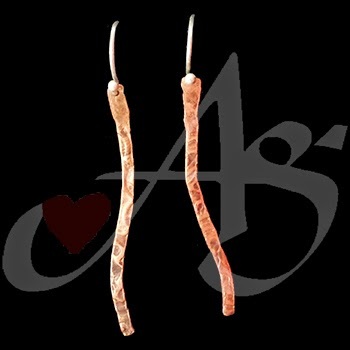 Here are another pair of earrings - embossed copper wire with a pounded copper wire knotted around the stem. The knot is movable. Makes the earrings fun! Argentinium hand crafted wire hooks. Enjoy!! 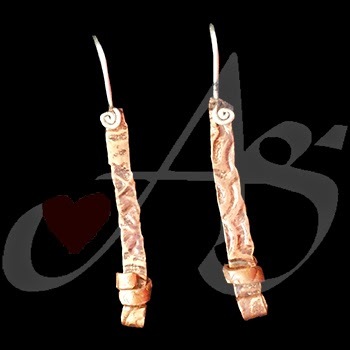 Earrings made of pounded copper wire with hand craftedargentinium silver hooks. Simple but classic and elegant!! Enjoy!! These earrings have a special effect - the square frames dangle perpendicular to each other, creating a 3-dimensional cube. 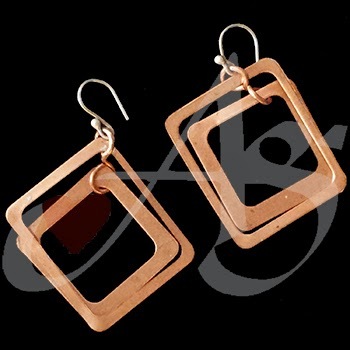 The frames are made of copper 24g metal and the earring hooks are constructed from Argentium Silver. Visit www.AgapeGifts.org for more creations!! Okay back to daily posting - sorry for the delay and image troubles!! I will begin this year with all the new pieces for 2015. 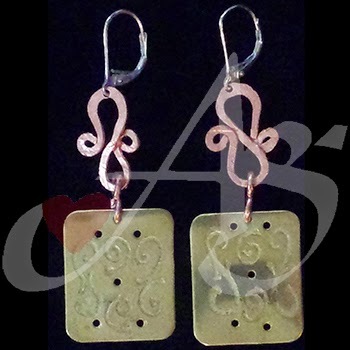 Here is a pair of earrings that have an accompanying bracelet. This earring has the technique of metal scribing or etching with metal piercing. The materials are brass and copper with sterling silver levers. Let's get the new year posts ROLLING!!! Okay back to daily posting - sorry for the delay!! I will begin this year with all the new pieces for 2015. Ring in the NEW YEAR with good news!!!! Sharing my great news - to start out the new year!!! Jewelry Arts Design Competition presented by Lapidary Journal Jewelry Artist magazine has chosen your work and you will soon be seeing your work in print! The Gemmys winning pieces will be featured in Interweave's hardbound showcase of the best in contemporary gem and jewelry art. From single pieces to suites, including non-jewelry metalwork and display gems, this publication will exhibit the best of the best in a variety of styles and subjects. YEAH!! My Joyful Journey Rosary Bracelet will be in PRINT! PUBLISHED CHECK! Stay tuned for a picture of the cover and THE page!! To honor my friend who recently just died from a stroke caused by cancer. Please pray for her.